Is your vehicle not running the right way? Keep your automobile running smoothly for every mile ahead with the services from Tilden Car Care Center. At our shop, our professionals are available to handle your auto repair service in Raleigh, NC. Whether your engine light came on or your brakes are not functioning properly, count on us to take care of every situation the right way. Our car repair services are available for all makes and models, including foreign and domestic vehicles. Speak with us today to request more information on our service options. Do You Need Auto Repair Service? Each day, you rely on your car to get you where you need to be. From school to work and everywhere in between, you use your vehicle to travel to every destination. When your vehicle is not running properly, it can leave you stranded with no way to get to where you have to go. Instead of spending money on a cab or turning to a loved one for a ride, call to speak with our staff to discuss your car repair options. Our repair services are designed to serve as an effective solution for all problems facing your automobile. We are able to work with all foreign and domestic makes and models. Whether you have a minor issue or a major breakdown, we have you covered with our different service options. Request our assistance today for quality work from our ASE-certified mechanics. From steering issue repairs to vehicle inspections, you can trust our team to deliver the top services for each of your needs. With more than 70 years of experience in the industry, our technicians have the knowledge and expertise you need to tackle your repairs. We are committed to delivering top services, quality workmanship, and comprehensive repairs at a price that fits any budget. Ensure that your car meets state standards when you bring it to us for your vehicle inspections. At our repair shop, our technicians are available to inspect every part of your ride. This important service will help you uncover any minor issues before they can develop into major problems that leave you stranded without a way around town. While other states have their own specific inspection standards, here in North Carolina an inspection is an annual requirement for all car owners. Without this inspection, you will be unable to renew your registration, and you will not legally be allowed to drive your automobile. Cross this essential step off your to-do list when you visit us for service. For many people, buying a car is one of the biggest investments that they will ever make in their lives. When something goes wrong with your automobile, make the right choice for service by taking it to our professionals for your auto repair. Our professionals are committed to helping you the investment that you have made in your vehicle. Don’t stress over finding a trustworthy shop for your auto services. Whether you drive a foreign or domestic car, you can trust that our technicians have your best interests at heart. Our goal is to get you out the door and back to your regular routine. Speak with our team at the first sign of trouble with your ride. We take care of the issue so that you can get where you need to be. While we offer foreign and domestic vehicle repair services, please note that we are unable to perform major engine work for cars from Mercedes, Volvo, and BMW. Nothing can ruin your day quite like discovering that you are in need of an auto repair. Instead of waiting around all day for an appointment to open up, turn to our car repair team for fast and efficient service. We are able to respond to your request as soon as possible to get you back on the road without delay. Trouble with your vehicle only seems to happen at the worst possible time. If you wake up to a car that won't start or to a broken vehicle heating system, don't hesitate to call on us for assistance. 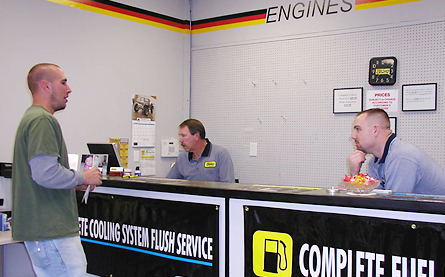 Our shop is open six days a week for your convenience, and we offer scheduling options to fit your busy schedule needs. Contact us to bring your vehicle to us for your repair services. We offer a series of options for foreign and domestic rides throughtout Raleigh, North Carolina.